The tale of Ali Baba and the Forty Thieves is one of the better known of the Arabian Nights stories and it follows the adventures of Ali Baba and his tussles with the gang of thieves. 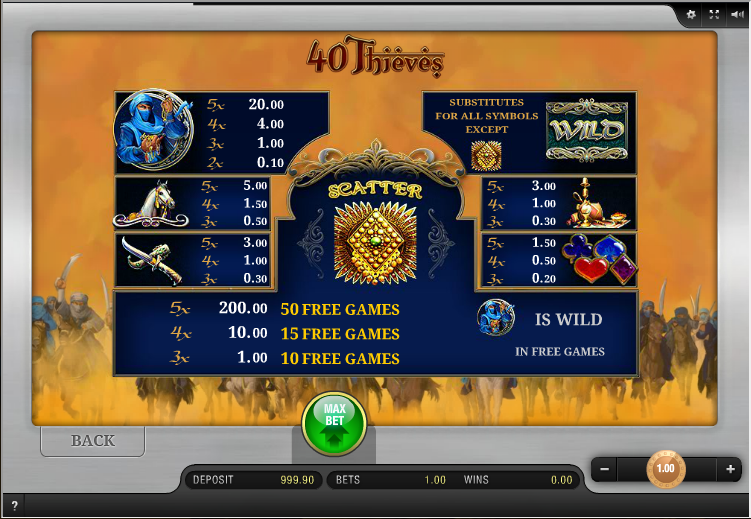 This online slot from Gamomat is entitled just 40 Thieves and you can read all about it in the review below. 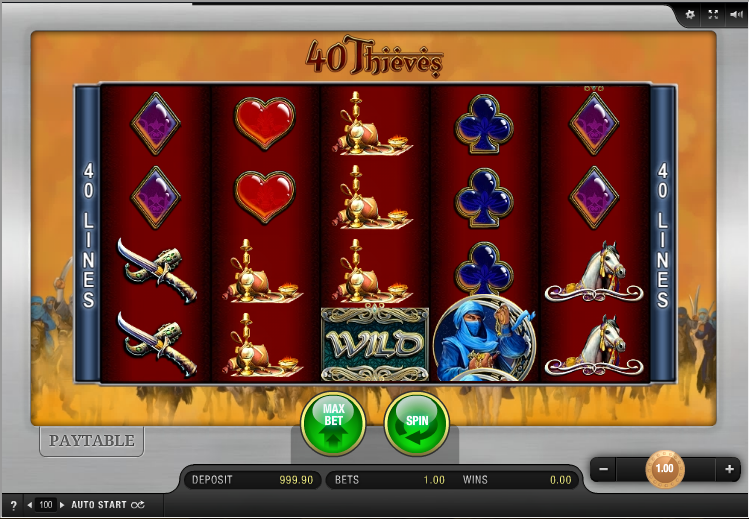 40 Thieves is a five reel slot with three rows and forty fixed paylines; the backdrop to those reels is a view of the thieves approaching on horseback through a haze of dust and sand. There are four theme-related symbols including one of the thieves, a horse, a dagger and a golden lamp; clubs, spades, hearts and diamonds of different colours make up the lower values. The wild is represented by a big ‘Wild’ icon and it will substitute for all others except the scatter which is a golden, jewelled ornament that activates the main feature. During this round the thief symbol becomes an extra wild which should help out with some big wins. Additionally, landing three+ more scatters will award more free spins. Card Gamble – a double or nothing game where you try and predict the colour of the next card drawn. Ladder Gamble – try and work you way up the ladder to increase your prize. There’s nothing particularly outstanding about 40 Thieves but it’s of a high quality and plays smoothly; there are some big wins available in the free spins round and it comes with an RTP of 96.09%.